Super Bowl LIII turned out to be rather uneventful, leaving us all wanting a little more. Naturally we’re looking ahead to next year’s NFL Championship game, Super Bowl LIV. So what teams will compete in 2020’s Super Bowl? Let’s check out the current NFL futures sportsbook odds to see what the bookmakers are predicting. Unsurprisingly, Tom Brady and the New England Patriots are facing the best odds out of the bunch. All in all this is a pretty safe bet seeing as how Belichick and the Pats have made 4 out of the last 5 Super Bowls. And out of those four, New England managed to win three of them. Something that is surprising is seeing the Chiefs facing the exact same 2020 Super Bowl betting odds New England is. Sure Kansas City blew us all away with their offensive consistency and explosiveness, but are they are a sure bet to make next year’s AFC Championship? Last season’s early Super Bowl betting odds featured the Los Angeles Rams facing some of the best odds of the group. We all saw how that prediction turned out, lending further credibility to the claim that the Chiefs will represent the AFC in Super Bowl LIV. But the odds aren’t the only reason you should back Kansas City this upcoming season. A quick look at what they accomplished this past season will convince you the above listed odds are worth the risk. Once the regular season was said and done, Kansas City came out as the AFC West Champions. The Chiefs seized the top place in the division by posting some ludicrous numbers on offense, thanks to their No. 1 scoring offense and No. 1 total offense. Ultimately most of the Chiefs offensive success came through the air, thanks to Patrick Mahomes and Kansas City’s 3rd rated passing offense. Mahomes delivered one of the most impressive breakout seasons the NFL has ever seen, posting 50 TDs, 5.097 passing yards to just 12 interceptions, culminating in a breathtaking 113.8 passer rating. The scary thing is we’ll be seeing a Mahomes with even more experience next season. This leads us to only one conclusion; the Chiefs’ offense will be even deadlier next season. One thing that should be mentioned is that the Chiefs will be without Kareem Hunt next season. Albeit their rushing attack ranked 16th in the NFL but it still contributed for nearly 116 yards per game. Hunt finished last year’s season with a total of 824 rushing yards so he contributed a good portion of Kansas city’s 1,855 rushing total on the year. Ultimately this won’t be an issue as the Chiefs have a multitude of options to fill that gap (free agency, draft) and already have several offensive options on their roster. Considering the season they’re coming off, and considering how young their talent is, the Chiefs are almost guaranteed to make next year’s Super Bowl. We saw the Rams find their way to the Super Bowl by employing the newest strategy to hit the NFL; build your team around a rookie quarterback. Nowadays so much emphasize is placed on developing quarterback talent as early as the high school level that many collegiate quarterbacks come into the NFL with considerable talent. And since the quarterback’s paycheck is usually the one that chews up the biggest chunk of an NFL team’s roster, signing a talented young quarterback on a rookie deal is paramount to finding success in the modern NFL era. Fortunately the Chiefs find themselves in that rather pristine position. This affords them to pick up any missing pieces they need to solidify their playoff standing for next year’s postseason. So are the Chiefs’ a shoo-in for the playoffs? After all, the Chargers gave them a run for their money this past season. On top of that, the Broncos aren’t any pushovers although the Raiders might turn out to be this upcoming season. The Chargers defense might be better than Kansas City’s, but it’s too early to tell who will get the best of who in this divisional battle. One thing that is guaranteed is that both teams will be in the running for the playoffs. Even if the Chiefs miss out on the divisional title, they won’t miss out on a Wild Card berth. But the last obstacle that the Chiefs will have to overcome on their way to the playoffs is the New England Patriots. Fortunately for Kansas City, they’ve had a pretty good track record against the Pats. Although Mahomes is 0-2 in his only two meetings versus Brady, he has yet to get dominated by New England. The first contest ended 40-43 in New England’s favor and the AFC Championship game resulted in a 37-31 overtime finish. Next time around Brady will be one year older and Mahomes will have even more experience. This certainly favors Kansas City. As the season approaches and develops the above listed odds are bound to change. This makes early Super Bowl betting even more vital as you are bound to get some of the best odds of the preseason and subsequent season. 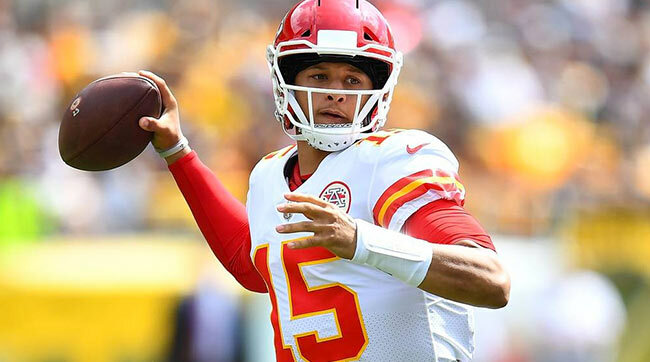 Right now there’s plenty of reason to believe in Kansas City and those odds are bound to drop as their success becomes more apparent. At the end of the day the Chiefs are the best bet due to how consistent the Pats are. It’s almost guaranteed that the AFC Championship game will come down to these two. The NFC on the other hand, isn’t nearly as predictable.